Minister for Children and Youth Affairs Katherine Zappone shared the stories of Syrian and Palestinian children living in County Mayo from our new publication A Strong Heart at her UN Security Council address on ‘Children in Armed Conflict’ this July. As Minister I am particularly proud that half of the 1,883 persons accepted into Ireland under resettlement and relocation programmes are children fleeing war and conflict. In addition Ireland is providing care for 79 children who arrived alone at our ports and airports. All of these children, from countries experiencing conflict such as Syria, Afghanistan and Eritrea, are making Ireland their home. They speak for themselves in a collection of stories and art created by Syrian and Palestinian children now living in Mayo in the West of Ireland. Through the book ‘A Strong Heart’ they tell of the beauty of their new home-towns, the local rivers, mountains and even the world famous salmon. They express their passion for Irish sport, their sense of fun and their hopes and dreams. Khaled and his classmates, Irish, Syrian and Palestinian, are flourishing. They are our future. The Minister’s full address can be viewed here. 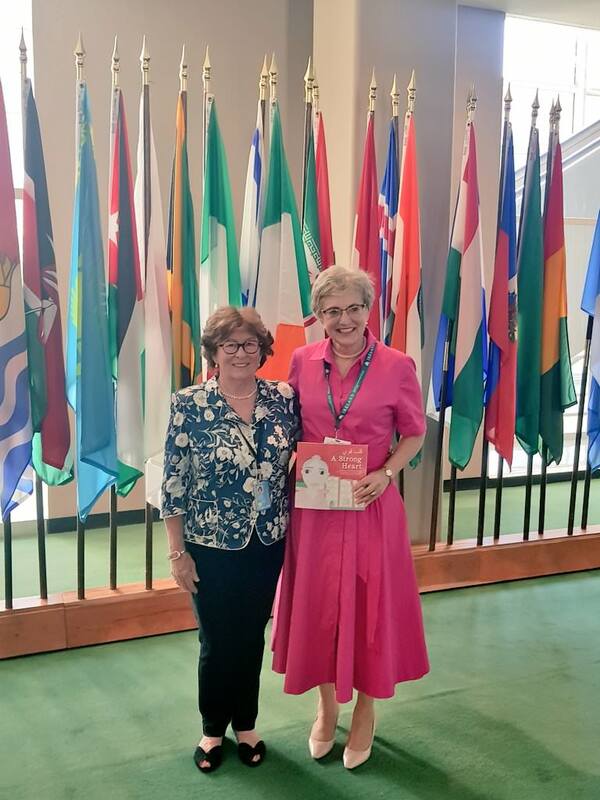 Minister Zappone also presented the publication to Louise Arbour, UN Special Representative for International Migration, following a discussion on child migrants. All proceeds support Kids’ Own’s bookmaking projects with children in Ireland.